Plots and Pickaxes: Big News! Hello all! 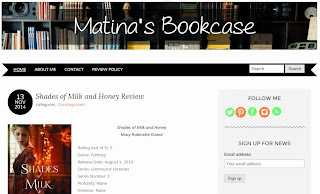 I wanted to let you know that I will be moving all of my posts on this blog to my new website Matina's Bookcase. This website will be much the same as the blogger just with a different name. I will still be posting book reviews, writing stuff, and other fun tidbits so don't think I'm going anywhere. For the time being I will still post reviews here as well, but all of my reviews will also be posted there. Most links will redirect you to Matina's Bookcase as well. Thanks for sticking with me through all of the moves and changes going on lately!